There are a few different techniques for cleaning catfish. The two most common methods are to skin and dress them, or to fillet them. On this page we will go over the steps for skinning these fish. We'll explain how to clean a catfish with some very simple, quick and easy to follow steps which shall have you cooking up your fresh batch of catfish within a short time. The following method below is an old school way of which I was taught how to clean a catfish back when I was a youngster. 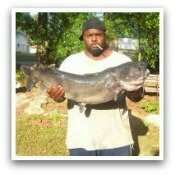 Place the catfish onto a wooden board or up against a tree. Tap a nail through the head of the catfish until it is secure in the wood. Or you may choose to firmly grasp the head of the catfish. Slice a slight incision into the skin behind the dorsal fin. Do this on both sides, about one inch of length will be good. Or you may create one continuous cut from one side to the other across the backbone. You only need to slice deep enough to penetrate the skin. You can remove the dorsal fin and any of the other fins by pulling them out with the pliers. Grasp the skin with the pliers and peel it straight down towards the tail. Repeat this with any of the remaining skin on the body. With some sections around the fins or belly you may have to pull the skin towards the opposite direction. With catfish in hand, cut into it from behind the gills, all the way around the head. Grasp the catfish and twist the head until the backbone snaps. Pull the head away from from the body. Some of the entrails will come out with it. Insert the knife into the vent and slice up through the belly. Open it up to remove the fat and the entrails. 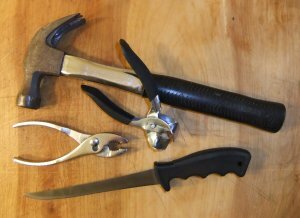 You can use the pliers to help pull out the tougher parts. Cut the tail off or leave it on. That's it. You now have a whole dressed catfish and ready to put over the fire. You can prepare it whole, fillet it, or cut it up as you wish. This is just one way of how to clean a catfish. Some people prefer to fillet catfish with the skin on. With either technique, some people may do it a little differently than others, although the results are very similar. Simply go with what works best for you.